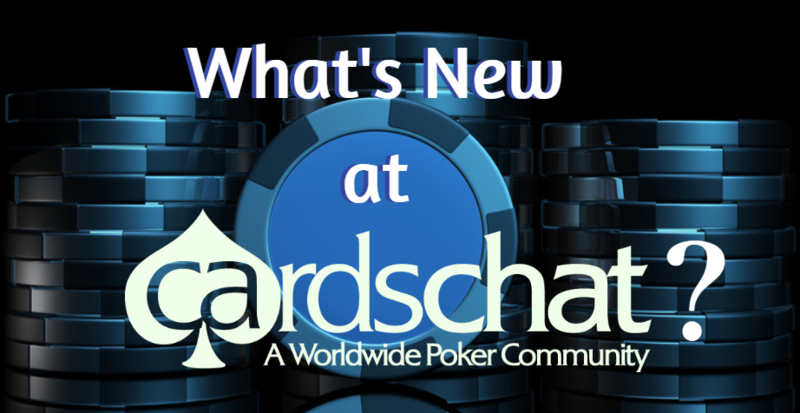 What's New in the CardsChat Community? With so much going on at CardsChat all the time, we thought it would be a good idea to have thread to keep you updated on all things CardsChat! Watch this thread for updates on special events, freerolls, member wins, and other news about the community. It seemed like a good time to start this thread now, as we come up on our biggest CardsChat party ever! We will be hitting our 250,000 members milestone any day now! Click on the link above to see all the goodies we have in store. In addition to the many regularly scheduled freerolls we have on a daily basis, we're adding another $26,000 in special events and money added freerolls!! But the really exciting part? All Members, regardless of post count or activity are eligible to play! You need to sign up for some of these games to get on a list, so click the link above for all the details. You do not want to miss this! The Summer session is 3 weeks in, and Marc's Maniacs are holding the lead. Still plenty of time and play left in the season! Will they stay on top? Members Bringing Home the Bacon! Carl Trooper (https://www.cardschat.com/members/carl-trooper/) and Ducky7 (https://www.cardschat.com/members/ducky7/) have been having a great summer! Check out their big wins playing live (including at the ***Record of Big Wins ! *** (https://www.cardschat.com/f46/record-big-wins-246717/) thread! They're in good company with other CardsChat Poker Gurus like Protential, Marginal, missjacki, and so many others! Not everyone can play in the big games, but plenty of members are bringing home a piece of the pie in our ***Record of Little Wins*** (https://www.cardschat.com/f46/record-little-wins-252626/) thread! Congrats to our most recent winners: CRStals, naruto_miu, Mortis, JillyChemung, jho, bekel285, Figaroo2 and so many others! Well done guys!! There's always something new happening at CardsChat! Watch this space! Similar Threads for: What's New in the CardsChat Community? Party poker 215 megastack and joesi and sergik their run in it I found inspirational. Thanks for the links you posted in this thread juiceeQ. So many great wins! And congrats to you on yours as well! This is the perfect thread to keep track of. Congrats Jim can you pick 6 random numbers between 1 and 50 please and I will use them in my euromillions lotto draw? Thank you!.I sometimes wander around the site for a long time.It's hard for me to navigate.This is it. This thread is really a great idea! Thank you Tammy, for posting all these great news here regarding the forum. Sorry for spamming. Just wanted to say this thread is a good idea. Good news. Thank you CardsChat! re: Poker & What's New in the CardsChat Community? The deadline to sign-up for these 250k Member Celebration freerolls is coming up fast! If you haven't signed up yet, do it now! Read the first post in each of these threads carefully for info on how to sign-up. How do you join a team for the summer league? I’m guessing I don’t qualify yet anyways but wondering for future leagues. Not sure if there is a fall, winter, etc league. By the way, you don’t want me on your team anyways unless you get a good handicap. Fall season signups will be around the beginning of October, so keep your eyes peeled! Thanks very much for the link. Definitely sounds like a lot of fun. I’ll keep my eyes out for sign up. I’m guessing it’s done as a home game so not available on mobile? Whenever I enter the page of CardsChat, I am surprised very, I believe that soon we will reach 500k, when more promotions appear, more and more new members make their registration in this wonderful site. Today is Game 3 of our 250K Member Celebration! Don't forget to register! Winner of this game receives a Daniel Negreanu Masterclass subscription!! Are there any poker chat users / members that live in the Greater Boston Massachusetts? Awesome stuff and congrats on the 250K CC! I need to start partaking in moreevents, but I've been busy with life . It's pretty cool to see how far CC has come. The games were live streamed last weekend, and will air nationwide on CBS Sports at a later date. Honestly, it's what we've all been waiting for. Our 250k big celebration freerolls start this weekend! This is a password protected game. We will post the password for all members about 30 minutes before start time. Again, password protected. Look in the Freerolls section for these passwords. We're also having our $5000 ACR/BCP freeroll on Sunday! This was one you had to sign up for, so if you were on the list, you should be preregistered. Sorry, but we cannot take any more sign ups for these. Did you miss Game 4 of the Kick Off Series? No worries! We rescheduled it for tomorrow at 4pm ET! If you're not in the home game club to play, get in there. I would love to get in all of it but I'm still aspiring to get in my first passwod game. And hurry and sign-up for this one, deadline is soon! I agree. I put in my request a few days ago and hope it doesn't take weeks/months to get approved Can't wait to be in the FRC! Tons of great events for all members, though. I'm registered on BCP for an upcoming MTT, feels good. You guys, you don't need to be in the Freeroll Club for these. Hi! Not sure what you mean. I was responding to his post. Hello members, I'm new here, I'm loving being part of the cardschat community and loving the posts of Juicee, hug! Thank you so much for receiving me so well! Please do not sign-up if you are in the US or other region that is blocked from real money play at PokerStars. You won't be able to play, and you will waste our time and PokerStars' time as well. This is a very useful thread! I check it every time I login! Things are heating up in the race to the money in CardsChat.com League (https://www.cardschat.com/f43/), after the first week of multipliers Debbies Dashing Devils are sitting in first place followed closely by Marc's Maniacs, All Guns Blazing and Matt's Riders, with 2 weeks left of 1.5x scoring then 2 weeks of double scoring it's still anyones League. Debbie the Captain of the Dashing Devils is sitting strongly on top of the MVP placings followed by GRIN281289 and Ribbybruno we have 4 weeks left of this season will Debbie keep her team and individual first place? while we're talking about the CC community, how about getting to know the staff better? Like putting names to the faces of the 6 fine young people in the photo of them holding the big 250000 plaque and waving?